Walther Leisler Kiep is one of the most independent and influential German post-war politicians. He is also a successful entrepreneur and longtime chairman of Atlantik-Brücke, the influential German-American friendship organization, which he now serves as honorary chairman. 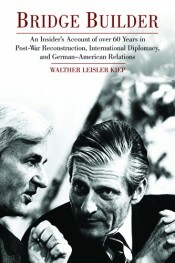 In his autobiography, Kiep speaks frankly about a life at the center of power: as an independent politician and treasurer of the governing CDU party from 1970 to 1991, who did not shrink from conflict with party leaders Helmut Kohl and Franz Josef Strauss; as Minister of Finance in Lower Saxony; as a longtime member of the Volkswagen Supervisory board for 21 years; and as an ambassador for German-American relations, and confidant of several US presidents. As well as presenting an inside history of the relationship between Germany and the United States, the book sheds particular light on the struggle for German unification and that country’s complex relationship with the Middle East. "One of Germany’s most distinguished statesmen, Dr. Walther Leisler Kiep has come to personify the commitment of postwar German leaders to close German-American relations. It was a distinct pleasure for me to collaborate with Walther, and I deeply valued his wise counsel. Through his ongoing passionate and persistent contributions as a leading foreign policy voice in Germany and as longtime chairman of Atlantik-Bruecke, Dr. Kiep has played an extraordinary role in building trust and mutual understanding between our two countries. His memoir is an invaluable addition to our understanding of international diplomacy." —William Glenn Gray, Purdue University. Walther Leisler Kiep is Honorary Chairman of Atlantik-Brücke, the private, nonprofit, nonpartisan organization that aims to develop strong relationships between Germany and the United States. He was treasurer of the CDU party in Germany from 1970 to 1991, and he has held a number of other important posts in German politics and served on many company boards in Europe, the United States, and Canada.